"...Good Stuff in West Los Angeles is where it all started in 1979. Owners Cris Bennett and Gary Bennett set off with determination and a deliciously fresh and healthy menu. With the idea of serving whole wheat buns, Zucchini Parmesan and fresh salads in a fast-food concept, Good Stuff was born.."
We ordered a couple of the original Good Stuff burgers with cheese. 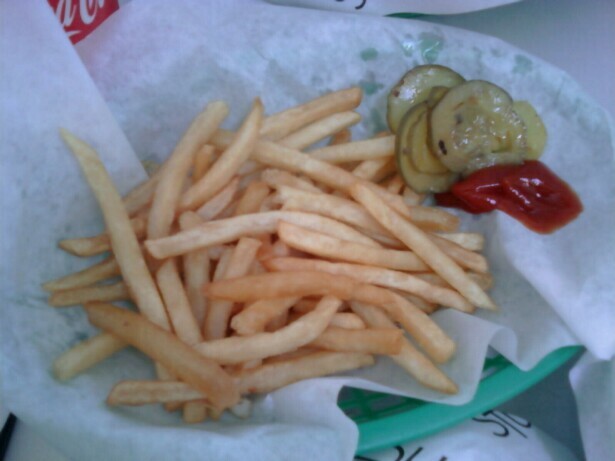 $4.40 each and a $.40 up-charge for a slice of cheese.....sigh. Oh well, at least we knew it was going to be good. There was just no way that a burger called "Good Stuff" at a restaurant called "Good Stuff" would make it in LA unless it was really good. 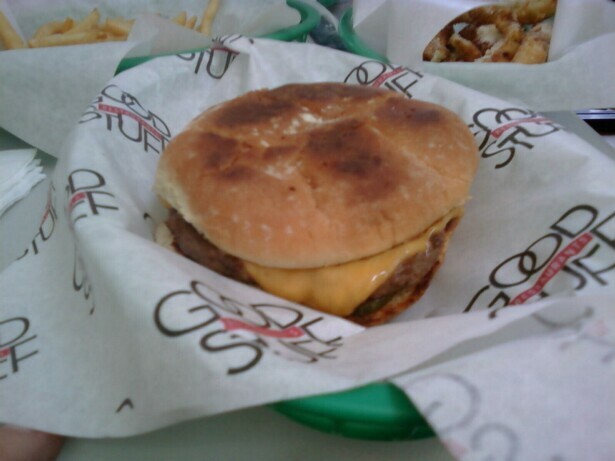 The Beef: Chuck--semi-lean (15% fat)--finely ground--processed into uniform, thin, 1/4 pound patties. The menu decried the beef to be "100% fresh", and that was probably true...back when the beef was actually fresh. I do not think that "fresh" meant what they thought it meant. This was typical, bland Chuck. Additionally, the patties were a little rubbery, indicating that the beef had been given quite a workout while being turned from livestock into burger patties. The dryness of the beef suggested that it had been held cool for many days, or that it had been previously frozen. Notwithstanding the foregoing, the burger meat itself was relatively flavorful. The Sear: It was half there. The sear lent little to the beef, and the beef was not juicy enough to develop a crunchy sear. 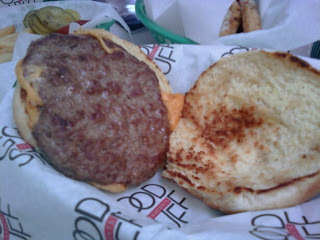 The Seasoning: This was weak--I had difficulty detecting any seasoning on the thin patty. The Cheese: Boring, bland Cheddar. Just like the cheeseburger at the Westside Tavern, this cheese brought NOTHING to the party--no savory, no umami, no creaminess. Standard, American cheese would have suited this under-seasoned dish far better. Sadly, they did not carry American cheese at Good Stuff. Meat to Bun Ratio: The bun ran away with this and overwhelmed the dish with dryness. 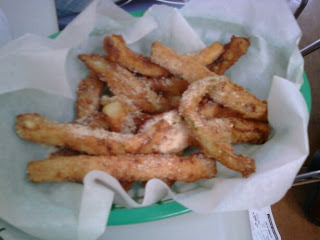 The Fries: At Good Stuff, the fries were cooked in safflower oil or something else with a low smoke point, which resulted in some pretty unexceptional fries. The fried zucchini--gross. It was cut WAY too thickly, so that it developed a snot-like texture. It was also painfully bland--as were the fries. The Value: Twenty bucks for a couple of 1/4 pound burgers on stale buns. WEAK...it's easy to find a better burger for less. Good Stuff was merely Mediocre Stuff. Burger Review : A below average burger for a an average price.